Inspector blogging: What just happened? Yesterday there was an incident at the police station where I work. It was mid morning and a man was overwhelmed by a mental health episode; a noisy and dramatic mental health episode. Sat at my desk I heard muffled screams of, "Help Me!". They had that note of desperation that made me think it was genuine. By the time I got outside I found myself on my lonesome looking at a police car with a smashed passenger door window. I was relieved that there wasn't any blood. I soon found the source of the commotion just round the corner being restrained by three of my colleagues. He had moments before been having a jolly good go at smashing up the police station, starting out by smashing his head through the police car window. The coppers inside the car had a bit of a shock and got covered in glass. I think one of the coppers was a Special Constable volunteer doing his very first shift with his tutor. I hope he comes back for a second shift. The man then tried to kick in the doors to the police station, again causing a bit of a shock to the one copper and the one member of police staff inside. There was a bit of a tussle and the poor fellow was restrained. Then a slow off the mark Inspector (me) turned up. No one was seriously hurt and the officers from the damaged police car spent the rest of a long day with this chap going to hospital, the local custody centre and eventually a distant mental health assessment centre. For the poor guy involved, and those who have not experienced stuff like this very much, it will have been a day that had a significant impact on them and one they will remember for a long time. For others, who have perhaps been coppers for a little longer, it will have been something to chat about over a cuppa and simply another Monday doing The Job. So much of being a copper is dealing with stuff day in and day out that most people only witness or become involved with on rare occasions. And it is so true that as a copper you really don't know what you will be doing on Monday, Tuesday or any other day of the week. I recently looked up what "the police" had dealt with in Cornwall and the Isles of Scilly during October. 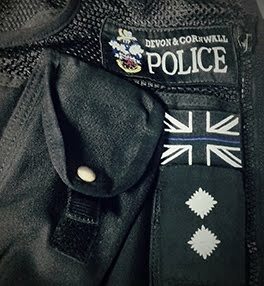 What the coppers here in Cornwall did during the days and nights of the week of October was handle 2,800 crime reports, 477 safeguarding non-crime enquires, 154 missing person reports, 462 road traffic collisions and 7,092 reported incidents. Each one of those numbers represents something really important that has happened to someone. Each one of these numbers represents part of a day's work for the coppers. That's it really. I just wanted to share that story and let you know "what just happened" in October. PS. The Special Constable did come back. Good man. PPS. Please drive safely, be kind and be honest here in Cornwall and wherever you find yourself.